In late 18th century, the backbone of the English battle fleet was composed of third-rate 74-gun ships - armed with a combination of 28 32-Pounder guns in the lower deck, 28 18-Pounder guns in the upper deck and 18 9-Pounder guns in the quarterdeck and in the forecastle. HMS Zealous was an Edgar class ship of the line. Similarly to the Bellona class, the Edgar class was one of the designs by Thomas Slade, using a slightly modified version of the original Arrogant design. Launched on June, 25th 1785, HMS Zealous served in a number of battles of the French Revolutionary Wars and the Napoleonic Wars notably the Battle of the Nile, where she engaged the French ship Guerriere, helping to force her surrender. The ship base, ship card and ship log are printed on two sides-the game data of a second ship is printed on the back. 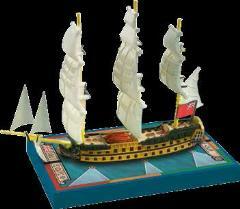 This ship pack can also be used to represent the British Bellona Class ship-of-the-line "HMS Superb 1760". Designed to be used with the tactical ship-to-ship game system created by Andrea Angiolino and Andrea Mainini, each Sails of Glory Ship Pack is a ready-to-play model, painted and assembled, 100% compatible with any other Sails of Glory game product. In each pack you will find all you need to play with the ship: a special base with gaming stats, a ship log and a specific deck of maneuver cards. This is not a complete game. You must own a Sails of Glory - Starter Set to play. CONTENTS OF EACH PACK: One 1/1000 scale model, special base with game stats, ship log, ship card, maneuver cards.